Continuous LED light and high-speed-sync flash, with "no recycle time"
Lighting manufacturer Rotolight has expanded its NEO series with an intriguing new product that marries a continuous LED panel with high-speed-sync (HSS) flash capabilities. Dubbed the NEO 2, the model is primarily aimed at portrait photographers and videographers, and follows the NEO unit that was announced back in 2014. The result of a collaboration with Swiss lighting specialist Elinchrom, the unit integrates Elinchrom's Skyport 2.4Ghz HSS wireless flash receiver in its design, which makes the use of a separate flash receiver unnecessary. This system promises compatibility with Canon, Nikon, Sony, Olympus, Panasonic cameras at launch, although support for Fujifilm models is said to be on the way. 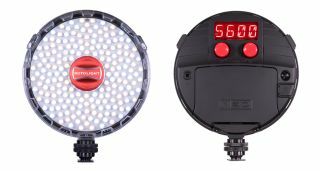 Not only does Rotolight state that the NEO 2 can be effectively used as a modelling light and high-speed flash at the same time, but also that this construction means there is no recycle time. This is in contrast to regular hot-shoe mounted flashguns, which typically require a moment after a flash has been fired before the next once can be deployed. Rotolight goes on to state that the unit is 85% brighter than the previous NEO when set to its continuous mode, but, no doubt thanks to the use of energy-efficient LED bulbs, also claims it can deliver 85,000 full-power flashes on a single set of rechargeable AA batteries. The NEO 2 can sync with shutter speeds as high as 1/8000sec and works on the same AccuColour LED technology as the original. As with that model, it's possible to adjust the colour temperature of the light in Kelvin, but here it applies to both flash and continuous lighting. The company has also updated it CineSFX lighting effects for the new model, which include fire, lighting and gunshot among others. “The NEO 2 is going to revolutionise how people use light, and eliminate the need for external flash," says Jason Lanier, a Sony Artisan of Imagery and professional photographer. "If you have those moments that you just cannot afford to miss, this is an incredible light for you. You’ll never miss a shot." The Rotolight NEO 2 is available to buy now at £249.99 (ex. VAT).